Basseterre, St. Kitts – The momentous judgment handed down by Her Ladyship the Honourable Justice Pearletta Lanns in the “Motion of No Confidence cases” of the Honourable Dr. Timothy Harris vs. the Hon. Curtis Martin, et al., and the Hon. Mark Brantley, et al., vs. the Hon. Curtis Martin, et al., “lays down the foundation of our democracy,” says Attorney General the Hon. Vincent Byron Jr. The two civil cases, which considered the same issues, sprang from Dec. 11, 2012, when the then-leader of the Opposition, the Hon. Mark Brantley, lodged with the clerk of the National Assembly a Motion of No Confidence in the Dr. Denzil Douglas-led administration. The claimants where Harris, who is now St. Kitts and Nevis’ prime minister; the Hon. Vance Amory; Brantley; the Hon. Sam Condor, now St. Kitts and Nevis’ permanent representative to the United Nations; the Hon. Eugene Hamilton, and the Hon. Shawn Richards. Five years ago, Brantley and his Team Unity colleagues requested that the Motion of No Confidence be placed on the Order Paper so that it could be debated in the Parliament. 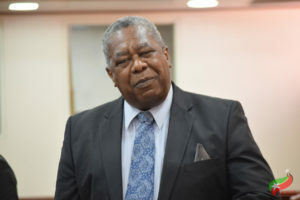 Their requests were ignored by then-Speaker of the House, Martin, which resulted in the claimants bringing the Motion of No Confidence cases before the St. Kitts Circuit. For more than two years, the Motion of No Confidence was never tabled, which deprived the parliamentarians of the opportunity to debate and vote on it in the Federal Parliament. This month’s judgment by the High Court Justice of St. Kitts and Nevis is “a vindication” of the six claimants, the attorney general said today in the Parliament.